Pu-erh tea (also commonly known as 'puer,' 'pu'er,' 'po lei' and 'bolay' tea, and known as 'dark tea' or 'black tea' in China) is a semi-rare type of tea that is made in Yunnan, China. In the West, pu-erh tea is known for its health benefits, but there are many misconceptions about pu-erh's flavor, processing, and other attributes. Read on to learn more about this mysterious and oft-misunderstood tea. 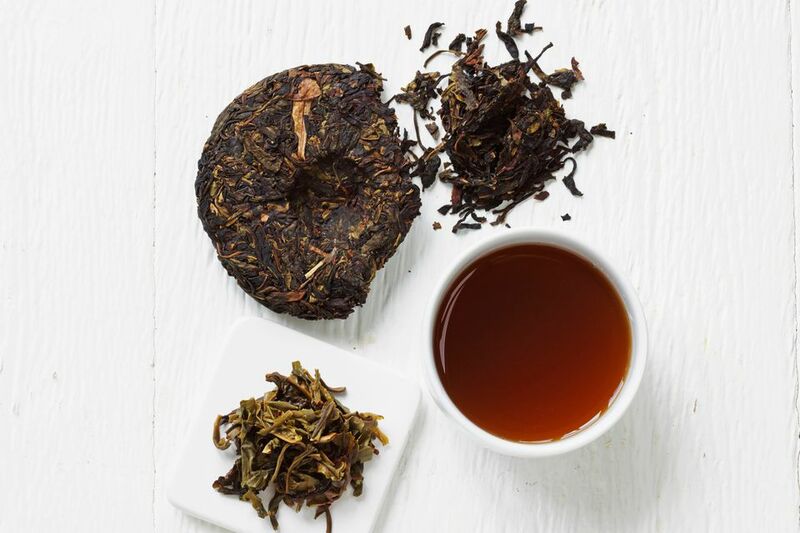 Good quality pu-erh tea has a deep, rich flavor that many consider earthy or mushroomy. Bad quality pu-erh often tastes muddy or moldy. Good quality pu-erh often appeals to coffee drinkers and pairs well with rich desserts. The flavor and reputed health benefits of pu-erh tea also make it a great option for drinking as a digestif after a heavy meal; indeed, in China and Hong Kong, it is often consumed during and after heavy or greasy meals, like dim sum. If you don't like the flavor of pu-erh on its own, there are many pu-erh blends on the market. Chrysanthemum pu-erh is a traditional Chinese blend used for its 'cleansing' effects, but there are also more 'contemporary' tea blends available. For example, Rishi's pu-erh blends include ginger pu-erh tea and vanilla-mint pu-erh tea. In traditional Chinese herbalism, pu-erh tea is considered to open the meridians, 'warm the middle burner' (the spleen and stomach) and be beneficial to 'blood cleansing' and digestion. For these reasons, it is often consumed after heavy meals or drunk as a hangover cure/preventative. Pu-erh originated thousands of years ago in the Yunnan Province of China, where large-leaf tea trees (Dayeh) grow. Its history relates closely to the tea trade between China and other nations (notably Tibet), and it is named for the town from which it was originally sold en route to other countries (Pu'er City). It was originally compressed into shapes for more efficient transit, and it acquired its dark color and flavor due to natural fermentation in transit to its final destinations. For many years, pu-erh has been aged. The aging process results in a slow fermentation, and it can take about 15 years for a 'raw' (unfermented) pu-erh to get the dark color and flavor that pu-erh drinkers desire. In the 1970s, a style of processing called shou processing (or 'cooking') was developed to expedite the fermentation process. Shou processing eventually led to a pu-erh collecting/investment 'bubble' in the 1990s and 2000s. During the pu-erh bubble, many impostor pu- erh teas were made with tea leaves grown outside of the traditional appellation of origin (Yunnan). Prices skyrocketed, many collectors began to hoard their aged pu-erhs and the quality of new pu-erhs plummeted as production ramped up to try to meet demand. Fortunately, the pu-erh bubble collapsed and production has more or less returned to normal. Sheng pu-erh is made from the minimally processed leaves of the large-leaf Yunnan tea tree, and then carefully aged under supervised conditions before it is consumed. This style of pu-erh is often aged for 15 or 20 years and can be aged for much longer for a deeper, richer, smoother, more complex flavor. Shou processing involves the application of heat and moisture, as well as the inoculation of the tea leaves with beneficial bacteria. It takes about a year for harvested tea leaves to become 'ripened' or 'finished' pu-erh. Some 'ripened' pu-erhs are also aged for a flavor more similar to traditionally produced pu -erh. One of the more distinctive characteristics of pu-erh tea is its many shapes. Pu-erh commonly comes in shaped forms, such as bricks, cakes (which are disc-shaped and also known as 'bing cha') and 'tuo cha' (which are shaped like tiny bowls). These shapes make the transport and storage of pu-erh convenient. Pu-erh may also be in loose form (like other loose-leaf teas) or packed into pomelo fruit or bamboo stalks. Occasionally, it is available in teabags. Although steeping pu-erh can seem daunting when you unwrap your first bing cha (pu-erh cake), it's really not that difficult. If you're making pu-erh from a compressed form of tea (rather than loose-leaf pu-erh), you'll need to gently pry off about a teaspoon or two of leaves. You can use a pu-erh knife (available from most pu-erh retailers) or another small, dull knife to do this. Once you have your pu-erh leaves ready to steep, you'll want to 'rinse' them, especially if the pu-erh is aged rather than cooked. Although some people say this is to remove dust that has settled on the tea during the aging process, it is actually to remove the dust that has formed as the pu-erh has fermented, as well as to 'awaken' the leaves (prepare them for infusion). To rinse your pu-erh, place the tea leaves in a brewing vessel, pour near-boiling water over them and then quickly discard the water. After you've rinsed your pu-erh, you're ready to steep it. Use water that's around 205 F and steep for 15 to 30 seconds (if using a yixing teapot or gaiwan) or three to five minutes (if using Western teaware). Some people prefer to use fully boiling water for a stronger flavor.